1. Lower basic cost with lightweight, low request for foundation, low consumption of steel. 2. High degree of standardization. We can produce the standard components which can be installed on-the-spot. 3. Simple, easy and efficient to install within a short amount of time due to superior component design which are connected by standard bolts. 4. Easy to understand . 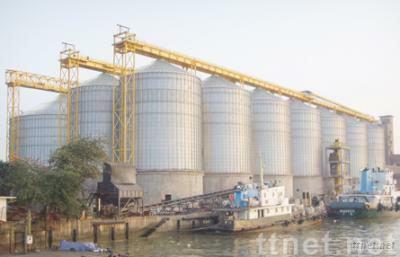 The bolted silo is equipped with relevant accessories, such as: conveyor, ventilation, drying and monitoring devices, etc. to ensure the quality and safety of the material stored in the silo. 5. Easy to maintain. As the parts of the silo are connected by standard bolts, so it is easy to remove or repair it. 6. Low cost and long tenure of use. The cost of bolted silo is just 35%-50% of the cement silo with the same specification; and its life span can reach 30 years.